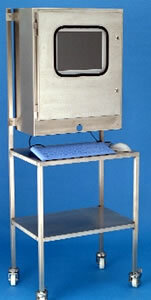 Stainless steel enclosure designed specifically for computer protection in food processing companies and pharmaceutical companies. Waterproof stainless steel enclosures allow the use of standard desktop computers in areas that need to be hosed down to ensure the complete area is clean. By using standard desktops and waterproof stainless steel enclosures you get reliability at a very reasonable price. Protect Standard PC’s in hostile environments. • Rubber keyboard and mouse sealed to IP65 included in the price. • Uses standard desktop or tower PC’s. You can use your current corporate standard PC and your current maintenance company. • The cost effective way to use computers in the food and pharmaceutical industries. • Upgrade your computers in the future without having to change your PC protection. • Manufactured from 316 Stainless Steel.